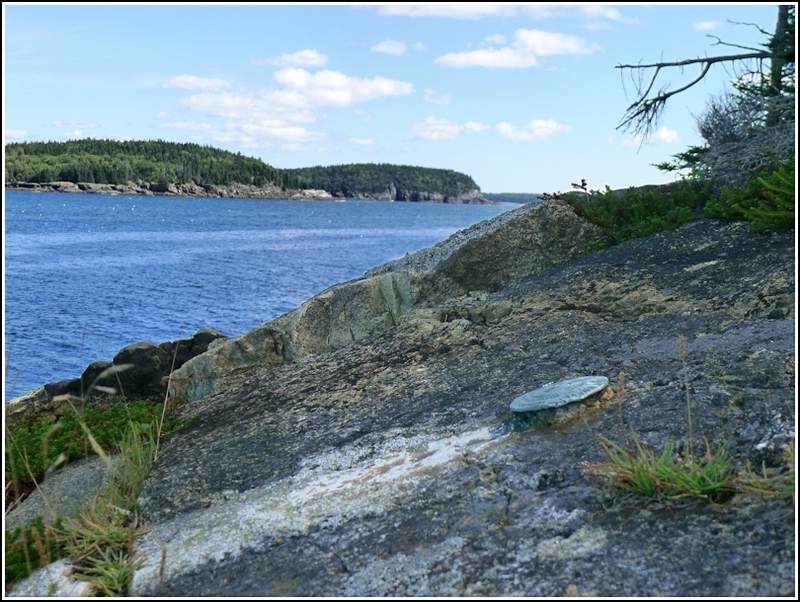 Many of the islands in Frenchman Bay hold topographic stations or triangulation stations. We've already searched for the ones that can be reached by tourist boat excursions. Most of the rest I've resigned myself to never finding. But about two years ago I began to think that two of these stations, SHEEP and POR, might be within reach. The prospect of finding two stations on a small island just off the shore from Bar Harbor was irresistible. The island can be reached easily by sea kayak. It is a short paddle from the Bar across the channel to Sheep Porcupine Island. Our first challenge was to learn how to sea kayak. We hired a local kayaking guide, Brescian of National Park Kayak Tours, who was more than happy to lead us on a custom route to Sheep Porcupine. We suited up (I still think I looked like a deranged lobsterman) and learned the basics before paddling our tandem kayak away from the sandbar, alongside Brescian. The flow in the channel was swift, and made even swifter by the wake of passing cruise ship tenders. But we quickly found our rhythm and all too soon, we were rolling up on the cobble beach of Sheep Porcupine Island. Immediately obvious was the fact that the "trail across the island from a pebble beach on the NW end" referred to in the description for SHEEP is completely overgrown. And by overgrown I don't mean "annoying high grass to wade through while swatting occasional high weeds away from your head," I mean "completely impenetrable forest of interlocking pine branches waiting to impale your body with every movement." I'm willing to fight my way through laurel thickets, picker bushes, and even desert cacti, but this was just a bit too much. Rich and I tried anyway, and got reasonably close to the coordinates, but we simply couldn't push through to the edge of the cliff where we expected to find the mark. We hadn't hiked too far, so it was easy enough to fight our way back to the cobble beach, from which vantage point we could reevaluate. Brescian was content to sit on the beach for as long as we needed (he could conduct business from his phone, and hey, he was being paid by the hour anyway). We decided to try to reach the mark from below by carefully picking our way toward the coordinates along the super-slippery north shore of the island. Which we did without major incident. 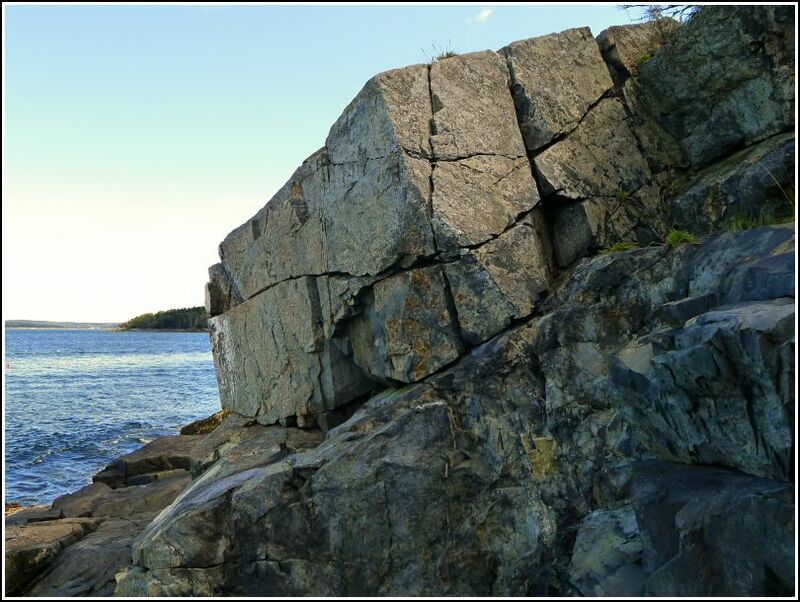 It was soon clear that the mark was indeed on top of the bluff, several meters above our heads. I was confident that I could climb up to the top of the bluff. But could I get back down? I decided the safest course of action would be to simply hoist myself up with one arm for long enough to reach over with the other arm and take a snapshot of the mark. That worked out quite well, and soon we were on our way back to the cobble beach. Have I mentioned that algae-covered rocks are slipperier than ice?! Something went wrong as I maneuvered over a small ledge. All of a sudden I was on the ground, with the sharpest SMACK! you can imagine, as I hit the rocks kneecaps first. Fortunately, the horrible smack was the sound of the tool bag I carried hitting the rocks, and not my knees, although at first I wasn't sure—because my knees got whacked too. 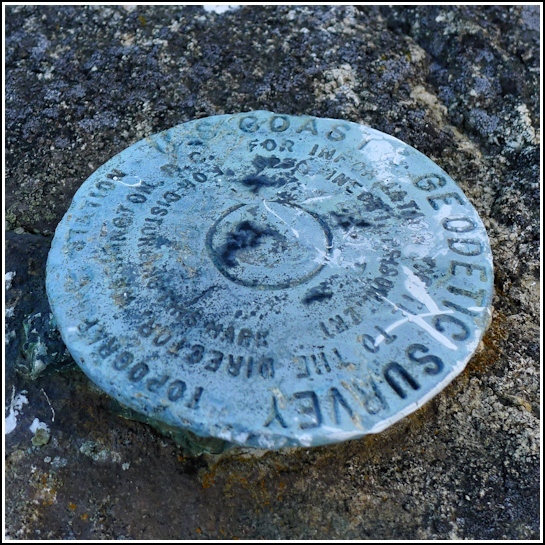 Station recovered in good condition atop a rock outcrop on Sheep Porcupine Island, part of Acadia National Park. The island is best approached by sea kayak at low tide. Land on the cobble beach on the northwestern side of the island and walk along the northern shoreline toward the station. Moderate climbing is required to reach the station. Approaching the station from the cliffs above is not recommended due to impenetrable vegetation. Note: The island is closed to public access annually from February 15 through August 31. The disk is set into this sloped bluff. A view of the bluff from below.